Others receiving 12 or more points: Science Hill 16. Others receiving 12 or more points: Oakdale 15. Red Boiling Springs 12. Early on, it was all White Station. The Spartans scored the first eight points of the game -- prompting an enraged Bray to take a quick timeout along the way -- and went into halftime leading 23-17. "We got out and pressured and played at a high level (early)," said Durham. "I told them not to get too hyped and we leveled off." While the Spartans (20-3, 6-1 in 16-AAA) were leveling off, Central (14-8, 7-0) was grinding its way back. The Warriors took the lead for keeps when sophomore Nina Davis (15 points) took a no-look pass from Aaliyah Whiteside and converted a three-point play to make it 36-33 early in the fourth. That started a 10-0 run that helped the Warriors grab control. Whiteside, who also finished with 15, hit a 3-pointer from the left wing and Jalen O'Bannon scored all four of her points in Central's decisive run. "We started getting some defensive boards, and we did a better job of pushing the tempo offensively," said Bray. White Station still had its chances though. O'Bannon was called for an intentional foul with 32 seconds left, and Ashley Small hit both free throws to make it 47-44. The Spartans, who were led by guard Breanna Ridgell's 18 points, got a good look on the ensuing possession, but Small's driving layup rimmed out and Central was able to make enough free throws to ride out the storm. Alexandria Winston, Bolton basketball: Winston, a 5-8 senior, scored 34 points in Saturday's 63-55 loss to Jackson North Side and added 14 points in the Wildcats' key 52-50 district win at Bartlett on Tuesday. As Memphis Central (Memphis, Tenn.) walked into the Riverdale (Murfreesboro, Tenn.) gym, home of the No. 7 team in the Powerade Fab 50, head coach Niki Bray was approached by an assistant coach. The coach wasn't from Riverdale, but from another team in the middle Tennessee region she'd rather not identify. "Why'd y'all come all this way to get your (butts) whipped?" Bray recalled being asked. Such is the cutthroat attitude of Tennessee basketball, especially of teams from the middle of the state towards schools in Memphis. The attitude, however, though archaic and unsportsmanlike is somehow justified because 1985 was the last time a Memphis-area program (Melrose High School) won the state's biggest (AAA) championship. Memphis Central, ranked 46th last week, silenced the Riverdale crowd with a 26-10 second quarter that put Bray's squad up 16 on Riverdale at the half. But the shaky start in the fourth quarter, which has become all too common for the Lady Warriors, prevented a second signature win, to go with its 82-79 win over then-No. 9 and now No. 15 Whitney Young (Chicago, Ill.). Memphis Central fell in overtime to Riverdale 74-72. Memphis Central has been the target of much criticism since the holiday break. Memphis Central, at 11-8, has twice as many losses as any team in the national high-school rankings. But the fact is nobody in the country has played as many top teams as Memphis Central. All eight of the Lady Warriors' losses have come from teams that were -- or are now -- ranked 17th or higher in the Powerade Fab 50. In November, the team lost to No. 4 Bolingbrook (Bolingbrook, Ill.). In December, during a 16-day road trip that sent the team to Hawaii and Arizona, the team fell to then No. 2 Brea Olinda (Brea, Calif.), currently No. 1 in the nation. No. 9 Long Beach Poly (Long Beach, Calif.) is currently No. 2; followed by No. 17 Monarch (Louisville, Colo.), now No. 17; and No. 43 St. Mary's (Stockton, Calif.), up to ninth this week. Memphis Central didn't schedule any breaks in its non-league schedule this month. The team traveled to Arkansas to play No. 23 North Little Rock (North Little Rock, Ark. ), this week's No. 16. Two weeks ago, the Lady Warriors traveled to St. Louis to play No. 6 Potter's House Christian (Jacksonville, Fla.), now No. 5. So the overtime loss to Riverdale follows a frustrating trend for the team of falling apart in the fourth quarter. But it also shows signs of progress by a team that lost by 20 to Bolingbrook and 26 to St. Mary's (Stockton, Calif.), because the Lady Warriors are hanging with top teams. In all, Bray believes her team is every bit as good as every opponent it has played, except for a Bolingbrook team that she thought was too big to match up with physically. The Lady Warriors, who have played the toughest schedule in the nation, will have traveled nearly 9,100 miles by the end of this week. The team is in its home stretch with just 170 miles remaining, including this weekend's trip to play regionally-ranked and defending state champion New Albany (New Albany, Miss.) before the district playoffs. The total distance traveled is eclipsed by just one team, No. 3 Mater Dei (Santa Ana, Calif.), which has logged more than 10,000 miles this season. Others receiving 12 or more points: Chuckey-Doak 13. Others receiving 12 or more points: Cloudland 19. Oakdale 19. Red Boiling Springs 19. Tuesday night, January 25th is Fan Appreciation Night honoring First Responders and Military Personnel (retired, reserved, and active) at St Benedict at Auburndale School. Varsity Girls at 6:00, Varsity Boys at 7:30. Using a ferocious full-court press, visiting White Station clawed back from a 12-point deficit to beat No. 6 Ridgeway, 66-55, in overtime Saturday. The Roadrunners had been the only local team to beat the Spartans, winning 72-67 at Spartan Palace on Dec. 17. White Station (19-2) trailed 30-24 at halftime and was down 12 after the Roadrunners scored six quick points to start the third. But White Station's press soon started to pay big dividends. "We knew we had to buckle down," said Spartans junior guard Alicia Payne. "We started to get some steals and some buckets." Payne had a huge hand in White Station's comeback, scoring all 13 of her points after halftime. Jasmine Settles came off the bench to score 12 for the Spartans; Breanna Ridgell also had 12. But the key was the inside play of 5-10 senior Ashley Small, who scored 18 points, including a basket in the paint with less than two seconds left that sent the game into overtime tied at 53. She also shared in the thankless task of defending Ridgeway star Hasina Muhammad, who finished with 23 points. Traveling far from home for college is not easy, but for two Memphians, Andrea Holmes (Mitchell) and Jasbriell Swain (Hornlake), the transition is working out just fine. They are excelling on the court and in the classroom at Binghamton University in New York. Andrea is a junior point guard, was America East Conference Rookie of the Year in 2009, has earned the America East women's basketball Player of the Week twice this season and in December lead the American East conference in scoring (15.4 ppg), assists (4.3 apg) and steals (2.9 spg). Jasbriell is a freshman guard, has started every game as a freshman and is 3rd in scoring (9.6ppg) for the team. The America East Conference interviewed the players on their transition from Memphis to New York. Check out the video. Several Memphis players are highly ranked in scoring for Tennessee. However, these statistics are incomplete. The statistics are based on players whose information has been added to the Maxpreps site. So, players if you know you should be in the ranking, encourage your coach to add your team information to the system. It's another avenue for exposure..
Central drops 18 to #46. Overton drops out of ranking. Kaylah Keys, Harding basketball: Keys, a sophomore, helped the Lions win two of three games this week by averaging 25 points per game. Against SBEC, she scored 37 points and added nine rebounds, four steals and two assists to help the Lions to the 61-44 win. We have some local players nominated for the 2011 McDonald's All American Game. The game is scheduled for March 30 at the United Center in Chicago. The Associated Press' Top 10 teams as selected by Tennessee AP-member sportswriters and broadcasters. With first-place votes in parentheses, records through January 15, total points based on 10 points for a first-place vote through one point for a 10th-place vote. Others receiving 12 or more points: Science Hill 12. Others receiving 12 or more points: Red Boiling Springs 21. Cloudland 13. Others receiving 12 or more points: Pope John Paul II 13. For awhile Sunday, it looked like Hazelwood Central had a good shot to knock off one of the best teams in the state of Tennessee. The Hawks led Memphis White Station, the No. 4 large school team in its state, 16-12 early in the second quarter of a MLK Girls Basketball Showcase game at North Tech. At that point, most in the stands likely thought Hazelwood Central was the superior team. "After the first quarter, I thought that, too," said Hawks coach Wendy Reeves. But then, as Reeves put it, her team just "fizzled." The Hawks quickly lost the lead thanks to a three-point play by Ashley Smalls and three- point baskets from Alicia Payne and Durriya Shields and the Spartans never trailed again en route to a 46-35 win. Webb City High School hurdled Memphis (Tenn.) Overton 62-59 on Sunday in the Martin Luther King Jr. Girls Basketball Showcase at North County Tech. Webb City improved to 14-2 with the win against the Wolverines (ranked No. 45 nationally by ESPN Rise). The Cardinals received 21 points from Kaitlin Jaeger, 20 from Kyndal Clark (who sank six 3s) and 16 from Hailey Roderique. Overton, which had won eight of its first 11 games this season, received 24 points from Cornelia Fondren and 16 from Cortrice Golden. The Briarcrest Christian's girls basketball team hung on by their fingernails to defeat host St. Benedict, 53-51, Friday night in a battle of two Dandy Dozen ranked teams. "FingerNAIL," said a relieved Saints' coach Lee Smith said after his eighth-ranked Saints (14-3, 2-0) got the early jump in Division 2-AA on No. 5 SBA (16-2, 1-1). Adrienne McKay, a 5-4 senior who has struggled with injuries and confidence much of her three seasons at Briarcrest, had a career-high 20 points, including all eight of the Saints' fourth-quarter points, and the winning free throws with 1.5 seconds left. Senior Starkitsha Luellen-Higgins (Melrose) made a significant contribution off the bench for Memphis, with a career-high eight points and five rebounds to her credit. Her rebounds and success in the paint helped get her teammates fired up and helped Memphis cut the double-digit deficit to nine at 59-50. 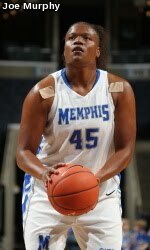 Unfortunately, the Memphis Tigers women's basketball team (13-4, 2-1 C-USA) had its 10-game winning streak snapped with a 60-55 loss to visiting UTEP (10-5, 2-1 C-USA) Thursday night, in the first Conference USA contest at the Elma Roane Fieldhouse this season. Overton up 1 to 45. Central down 6 to 28. Derrica Wiggins, Oakhaven basketball: Wiggins, a 5-6 freshman, finished with 29 points in the Hawks’ 76-64 victory last Friday over Fairley. She added 19 in Oakhaven’s 66-28 victory Tuesday over Carver. Wiggins is leading the Memphis area in scoring at 24.18 points per game. Central, Ridgeway, Overton and White Station will be heading to St. Louis to participate in Girl Powher Showcases St. Louis MLK event this Martin Luther King Holiday weekend. ....Last year, Merritt's baby featured 10 teams and was a one-day event with just 10 teams involved. This year, he's expanded it to two days -- Sunday and Monday -- 11 games and 16 teams from Missouri, Illinois, Tennessee, Ohio and Florida. ......Rolfes said he doesn't know a whole lot about his opponent in the event. "I know they have one very good player who's going to Auburn," Rolfes said of 6-1 guard/forward Hasina Muhammad. "Besides that, I haven't watched them." The 5 p.m. game Monday also will be a dandy, with national powers Potters House Christian of Florida (No. 6 in the nation) and Memphis Central (No. 22 nationally) doing battle. In other games Monday, North Tech will take on East St. Louis at 11 a.m., Memphis White Station plays Career Academy at 12:30 p.m., Chicago Whitney Young (No. 19) plays Memphis Overton (No. 47) at 2 p.m., and Butlersville (Ohio) plays Metro at 3:30 p.m.
Sunday's schedule is as follows: Cahokia vs. Career Academy at noon, Memphis White Station vs. Hazelwood Central at 1:45 p.m., McCluer North vs Butlersville at 3:30 p.m.; Memphis Overton vs. Webb City (No. 1 in Missouri Class 5) at 5:15 p.m., and Memphis Ridgeway vs. Potters House at 7 p.m.
Dan Olson is a former women's college basketball coach and longtime recruiting analyst. His subscription-based website, Dan Olson Collegiate Girls Basketball Report, is one of the most comprehensive in the industry. Each week, Olson will provide insight into past, current, and future SEC recruits. "She can do everything," Olson said. "She can handle the ball in transition and gives Tennessee one of those guard-forward type of players they have always had, and currently have, with size on the perimeter. She can beat you with a post-up game if you want to isolate her, or she can beat you deep. She is a great athlete who can get out in transition. She is a special player. She probably broke a lot of hearts in the state of North Carolina when she made her decision to go to Tennessee." "She can face up and shoot threes or jump over people (to score)," Olson said. "She hasn't even touched her potential yet. She could be a first-team All-SEC level kid for more than one year once she learns the game and figures it out and really refines her offensive and defensive skills. 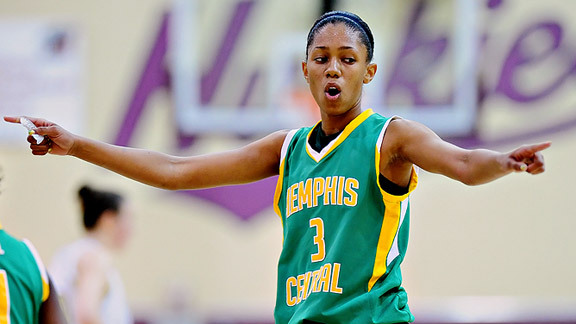 She is going to be a fun player to watch as time goes on in the SEC." "She is a U.S. National team point guard," Olson said. "She and Cassie Peoples (Texas) are two of the best point guards in the country. She is a really smooth distributor of the ball, and you have to respect her deep or she will bury the jump shot. She should have an impact sooner than later in the SEC." "She is a spider woman," said Olson, who agreed Muhammad compares to former Auburn All-American DeWanna Bonner. "She has a long, long thin frame. Her wingspan is like Ralph Sampson-ish. (Sampson was a 7-foot-4 center who played for the University of Virginia and went on to a career in the NBA, most notably with the Houston Rockets.) She is great off the dribble. She can bury a jump shot if you leave her be. She has superior size for her position with her length. She is tailor made for up-tempo, pressure basketball." "She is a big guard who has versatility on the perimeter," Olson said. "She is a point guard who makes plays, runs the team, makes good decisions with and without the ball, and has great leadership qualities. The kid is a winner." Here is the latest Statistical Leaders recently released from Gentry Statistical Services. Others receiving 12 or more points: Macon County 13. 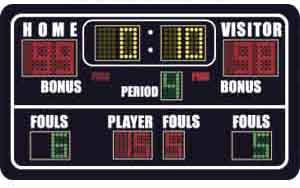 There was a time the Memphis-Area Home Education Association Lady Eagles had little trouble filling up their basketball schedule. Opposing teams would hear about the Memphis-based home-school squad and have visions of easy W's dancing through their heads. "It used to be real easy," said Lady Eagles coach Tracy Rice. "It's a lot harder now." That's because over the last couple of seasons the Lady Eagles have been competitive with area private and public schools. Already this season, MHEA has split two games with a Briarcrest team that is ranked eighth in the Dandy Dozen, and has defeated Germantown and University School of Jackson. The Lady Eagles, 15-4 entering Friday night, finished third in the G7 Hoopz Holiday Classic at Lausanne and lost in the final minute against seventh-ranked Arlington after leading for much of the game. Later this month they will take on No. 5 St. Benedict, a team they defeated last season. ESPN HoopGurlz's Lisa Bodine liked what she saw out of "Big Baby" over the holiday break. Check out what she had to say. Cortrice Golden, Overton (Memphis, Tenn.): You can add Cortrice Golden to the list of next generation of post players that can operate outside of the paint. At the Boo Williams\Ron Curry Holiday Classic, she had fans drawing comparisons to Texas A&M star forward Danielle Adams with her combination of size, basketball skills and toughness. As a team Overton does an excellent job spacing the floor, which gives her plenty of room to operate offensively. Golden's ability to make plays away from the basket created all sorts of match up problems for the opponents post players, especially since she can penetrate off the dribble. She is deceptively athletic and very active defensively; she was able to keep the Bishop McNamara's (Forestville, Md.) interior players from getting comfortable position on the block. With Golden's versatility and inspired play, Overton should be a tough matchup for the rest of its season. During basketball season, players can go through periods of highs and lows. If you are at a low period right now, try one or two techniques from this video to help you. 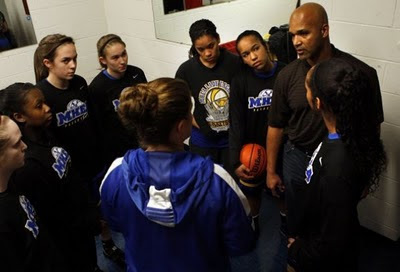 Please post a comment on this blog and let me know what you think about confidence in girls basketball. Just scroll down to leave a comment. This should be your thoughts on what you heard in the video or other ways you have gotten your confidence back. I will be personally responding to the comments. Central moves up 6 to #22. Overton's lost to #45 Oak Hill at the Ronald Curry Boo Williams event hurt them greatly. They dropped 23 spots to #47. Riverdale (Murfreesboro, Tenn.) stormed up from No. 40 to No. 7 on the strength of a dominating performance, including a victory over then-No. 6 Buford (Buford, Ga.) at the Peach State Invitational in Duluth, Ga. According to Hoopgurlz, the defending Tennessee AAA champions, Riverdale, have one more important test before state playoffs begin Jan. 22 when Riverdale plays host to Memphis Central (Memphis, Tenn.). Though Niki Bray's Memphis Central squad has had a rough start to its season, it traveled all the way to Hawaii and played in the top bracket of the Nike Tournament of Champions in Phoenix. The team may not have the record to back up its early season ranking, but overlooking this talent-laden team would be a colossal mistake. And one Wild has no intention of letting his team commit. Here is the Top 20 Scorers recently released from Gentry Statistical Services. Overton (66) -- Cornelia Fondren 15, Cortrice Golden 18, Ebony Hayes 7, Kenesha Jackson 13, Megan McGoughy 4, Briana Neal 4, Jasmine Stafford 5. Ridgeway (53) -- Jameka Barr 4, Tamara Bates 4, Shervonte Bright 10, Ashley Jackson 13, Hasina Muhammad 11, Odegua Oigbokie 11. Records -- Overton 10-3 (3-0, 15-AAA), Ridgeway 9-1 (2-1). Center Hill junior guard Jasmine Golden never said whether or not she had Tuesday night’s crucial MHSAA Region 2-4A game against Lafayette circled on her calendar. However, she can recall how long she has been talking about the Lady Mustangs’ meeting against the perennial power Lady Commodores. In arguably its toughest matchup in the program’s five-year history, Center Hill escaped with a 44-41 confidence-building victory against a visiting Lafayette squad that is ranked No. 5 in Mississippi by Maxpreps.com. Golden, the team’s top scorer who entered Tuesday’s game averaging 16.8 points, was her usual reliable self, pouring in a game-high 24 points on 10-of-13 shooting to lead the No. 23-ranked Lady Mustangs (15-2, 3-1 in 2-4A). Girls and boys, 6/7:30 p.m. -- Central at Mitchell, Hamilton at East, White Station at Whitehaven, Arlington at Bartlett, Bolton at Cordova, Raleigh-Egypt at Millington, Collierville at Germantown, Wooddale at Houston, Kirby at Southwind, Overton at Ridgeway, Kingsbury at Frayser, Manassas at Northside, Hillcrest at Washington, Fairley at Carver, Sheffield at Oakhaven, City University at MASE, Middle College at Westwood, MAHS at Douglass, Craigmont at Trezevant, Brighton at St. Benedict, ECS at Bishop Byrne, Lausanne at Catholic, Harding at FACS, Rossville at Fayette Academy, USJ at St. George's, TRA at Jackson Christian, Lafayette at Center Hill, Hernando at Horn Lake, Tunica Rosa Fort at Lewisburg, West Memphis at Forrest City, Marion at Paragould. Girls only, 6 p.m. -- MHEA at Hutchsion, St. Mary's at SBEC.